Welcome! 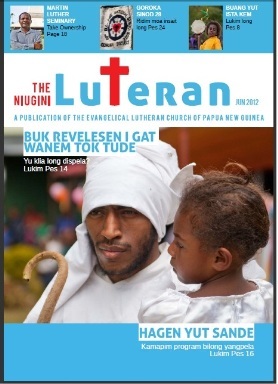 to the website of the Evangelical Lutheran Church of Papua New Guinea. The website will introduce you to WHO WE ARE, WHAT WE BELIEVE as a Christian denomination in PNG and OUR MINISTRIES that puts our faith into action. The ELC-PNG has a membership of over 1.2 million all throughout Papua New Guinea. This is approximately 20% of the total 5 million population of the country. The ELC-PNG anniversary day is celebrated on the 12 of July every year. This is the date when the pioneer missionary Rev. Johaness Frierl first started his mission as a Lutheran pastor to reach to the people of Papua New Guinea in 1886.This year 2011, the Lutherans in PNG will celebrate her 125 years of establishment. The official logo of the ELC-PNG shown above bears the hand of white man handing over the cross to a black man, the background image is the map of Papua New Guinea and they are inside the Luther's Rose. With Jesus Christ as the supreme head of ELC-PNG, we have three officials that look after and adminsiter His work here, the Head Bishop, Assistant Bishop and General Secretary. ELC-PNG has 17 Districts and 7 Departments. Districts are the Regional Settings of the Church throughout PNG whilst the department Minister the works that ELC-PNG serve God by providing to the people. Find more as you surf through… ENJOY!